Richard D. Heideman, one of the foremost legal experts on fighting the BDS movement, seeks to repair the tarnished name of Zionism. By Tamara Zieve – The impact of the Boycott, Divestments and Sanctions movement against Israel on US campuses is worse than most people realize, according to Richard D. Heideman, a Washington-based attorney who is a nominee for the president of the American Zionist Movement, which is set to hold elections in March. In an interview with The Jerusalem Post in Jerusalem last week, Heideman recounted an exchange he recently had with students at the University of Michigan, where he studied many years ago. “I was shocked to hear about the intimidation and threats they receive – it’s more than rallies trying to encourage organizations to divest investments in Israel – it’s really the making of violent attacks that physically threatens and intimidates a student body. Some say it’s free speech – I think it’s hate speech and has to be talked down and responded to,” he said. He believes that such activity is having a damaging effect on the identity of young Jewish students and of their views of Israel. When you feel intimidated, it thwarts the willingness to speak out freely in an exchange of ideas,” he explained. Heideman is one of the foremost legal experts on fighting the BDS movement and pursuing legal actions on behalf of victims of terrorism in courts around the world. He also serves as the chairman of the Israel Forever Foundation and honorary president of B’nai B’rith International. He says a major shift in tactics against Israel came following the country’s victories in the 1967 and 1973 wars. “Those who were against Israel as a nation-state shifted from a strategy of planned physical attacks to an attack in public upon the good name of Israel and the good name of the Zionist movement. Heideman believes that those who oppose Israel’s very existence, including the Islamic Republic of Iran and the PLO, have been winning that war. “We have done a terrible job standing up for our own good name,” he opines. He notes that while the “Zionism is racism” determination was later revoked, he says the UN has since been used for Israel-bashing. 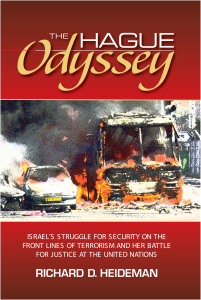 “It has been a well-planned attack and it continues to this very day…what we face is a mixture of assaults on Israel and the Jewish people, not only verbally but also threats and continued physical attacks – not by a formal army, but by terrorist organizations and individuals who identify with those who prefer to teach and practice hate and who do so under the guise of freedom-fighting,” Heideman says. “When you’re afraid to wear religious symbols, you don’t enjoy freedom of religion and when that fear precludes you – even those who don’t come here [to Israel] out of fear – it’s proof of the negative results of the concentrated effort to assault and malign Israel and the Jewish people. Heideman’s mission is to repair Israel’s tainted image through truth and advocacy. “The last time I saw my grandmother before she passed away, she said ‘don’t ever forget that at the end of your days all you will take with you is your good name,’” he recounts. “The good name of Israel and the Jewish people is very precious,” he stresses. He believes focus groups would be helpful in understanding Diaspora views of Israel, Judaism and Zionism. He believes education, particularly of the younger generation, is key to arming Diaspora Jews with the right tools to stand up and respond to the bashing. “Most young people will not, cannot and don’t know how to respond because it’s easier to walk around and avoid the conflict.” He acknowledges the increase of campus activity by Jewish and Zionist organizations to change that, but says it is not yet enough. While Heideman acknowledges that politics inevitably play a part in this discussion, he highlights that up until the recent past the Left and the Right in the US agreed that Israel must not become a political football. He now wants to concentrate on a path for the future that will allow a greater coalescing of people to positively support Israel and its centrality in the lives of the Jewish people, and to rally around Zionism as a proud movement.